Welcome to Worthington, Ohio! A historic community with tree-lined streets that continue to attract families and businesses. There are many attractions and things to do in this suburb of Columbus, Ohio. Worthington sits on the northern side of Columbus close to freeways, shopping malls, downtown, and more! Downtown Worthington – Downtown District with specialty shops and restaurants. Farmers Market – Summer and Winter in Downtown Worthington. Orange Johnson House – Pioneer home of Franklin County on it’s original foundation. Jeffers Mound – Surviving portion of the Hopewell Indian earthwork. Worthington Pools – 3 multi-purpose pools, slides, rafts, diving boards, and adult only pool! Ohio Railway Museum – One of the oldest railway museums in America. American Whistle Corporation – The ONLY manufacturer of metal whistles. McConnell Arts Center – Performing, visual, and literary arts. Rush Creek Village – Community in which each house is uniquely designed for the lifestyle of the homeowner, inspired by the organic architecture of Frank Lloyd Wright. The Worthington School District is highly ranked with the Ohio Department of Education giving it an “Excellent” rating. With high scores and ratings across the board. Click to see what homes are for sale currently in Worthington, Ohio. Here are Keller Williams Capital Partners, our agents are experienced and familiar with the local real estate markets. Our agents can help you find the right home for you here in Worthington. If you are thinking of moving to Worthington, Ohio, find an experienced real estate agent who knows the area and who is familiar with the local housing market. If you liked Lincoln Logs and LEGOs as a kid, you’re probably not alone! These building toys are as inspiring today as they ever were. Both the Columbus Art Museum (CMA) and Center of Science and Industry (COSI) are championing creative ways Legos are very much a part of playtime in modern day. I spent a whole weekend recently viewing highly imaginative ways big and small pieces of plastic can be put together to create masterpieces. LEGOs are one of those rare ‘toys’ that bring families and multi-generational groups together to enjoy the limitless possibilities of imaginative play. The simplicity of design has a lot to do with LEGOs staying power; it has remained virtually unchanged in design, though, today’s building bricks come in a variety of colors and hundreds of shapes and sizes. Obvious connoisseurs and LEGO fanatics from right here in Buckeye Central have put talent and energy into interlocking hundreds and thousands of these building blocks. One of the local exhibits features an entire downtown Columbus, Ohio streetscape with several blocks of familiar skyscrapers. There is also a replica of the Ohio State University football stadium; this is an award-winning creation I felt privileged to see with my own eyes. Two of Columbus’ best places for exhibiting creativity have big plans to keep building on Lego-mania this winter. The fascination with LEGOs that hit our Capital City is part of a worldwide ‘Lego Cult’. Seriously! A bucket of LEGOs has different outcomes every time they’re dumped out. Everyone from artists to engineers can relate; and there’s tons of evidence to show what happens when experimentation and critical thinking skills combine with LEGOs! Finalists are now on display at CMA. Winners will be awarded prizes in January at the exhibit’s conclusion. Someone entered a whimsical Taco Truck; and there are sci-fi creatures as well as caricatures of favorite cartoons, all made entirely out of LEGO® Bricks. The LEGO artwork shared by The Central Ohio LEGO Train Club is amazing. Their room-sized, crowd-pleasing depiction of downtown Columbus includes landmarks. If you go see the CMA exhibit, try to find the Batman figure perched at the top of one high rise and the garden gnome they placed in our city for fun. COSI’s large Lego exhibit featured on the first floor will remain through next year too. I personally observed numerous “Wreck-It Ralph” juniors having their way with some of the big LEGO bricks (fortunately these were made of a rubbery material). I also saw young children and elderly adults all equally busy with their hands enjoying play-time.I can’t think of a better way to use imagination and spend quality time learning about construction! I know there will be a bucket under the tree in my home this year! If you go on-line, you can learn more about some of the Ohio kids who entered their designs of castle life for the local LEGO building contests. Their stories are unique and interesting and reveal the inspiration they get when they turn toy building materials into works of art and fully functioning life-size objects. To view more photos from the LEGO display, visit Leslie’s blog here. Keller Williams is awarded the J.D. Power & Associates Award for Customer Satisfaction for both Home Buyers and Sellers! Not only is Keller Williams ranked highest in customer satisfaction for both buyers and sellesr, but KW also achieves the highest scores in ALL factors across both segments. We are very proud of this! KW scores highest in the Agent/Salesperson category which is the most important aspect of the customer experience. See how a Keller Williams Agent in Central Ohio can help you! 17% of home buyers purchased a foreclosure and 14% purchased a short sale. We are very proud to show off our J.D. Power & Associates Award, especially because it is determined by actual home buyers and sellers. Thank you for your continued support and we look forward to working with all of you in the future! * 2012 Home Buyer/Seller includes more than 2,990 evaluations from more than 2,790 respondents who bought or sold a home between March 2011 and April 2012. Salute a Veteran Today & Every day. I attended a recent star-spangled patriotic event honoring veterans. I am so not a fan of war. The thought of actual combat is frightening to me, to say the least. Every Veterans Day we Americans pay tribute to our military might and the muscle that makes this country stand free. The evening of remembrance and recognition I attended served up all the red, white, and blue I needed, to rightly overcome the dark and dread-filled thoughts I encountered at this same ceremony. I was one of the people in a crowd of maybe 200+ who stood at attention in the Grace Polaris Auditorium, alongside dozens of men and women in cleanly pressed uniforms representing each respective division of the military service. It was an overwhelmingly emotional couple of hours filled with music and audio-visual presentations, drama and personal testimonials, and, scrumptious apple pie for dessert which sweetly concluded the services. I left uplifted; this pumped up my patriotic spirits for another year. I felt truly honored, honoring those who put their lives on the line. It occurred to me as I sat and listened to several speakers, that tributes to soldiers should not be reduced to a once-a-year showing of support. For all who fought for our freedom throughout history and every USA soldier who will fight for our country’s liberties in the future, we Americans need to stand up and salute every single one of them every time we have an opportunity. Yes; I mean we should all be doing things like cheering whenever we see a soldier in an airport; proudly paying these individuals tribute by walking up to them and saying ‘thanks’; it means a lot to every man and woman who wears an American military service uniform, to know how much this country cares that they do what they do for US to claim our freedoms here in the U.S.! I dealt with personal glimpses of battlefield bloodshed while the bandstand performed 40s-style toe-tapping music. During this recent pre-veterans day commencement I held my hand on my heart engulfed in thankfulness, as flags were waving. This event was prepared expertly. It provided a glimpse at over 200 years of American independence through music, media, AND an all-American apple pie reception afterward. It was good to be surrounded by a diverse group of Americans who all stood proudly honoring past veterans and current service personnel, and proclaiming to stand with the military families—those who wait behind and pray for the safe return of their loved ones. One featured speaker, Major General Deborah A. Ashenhurst, Ohio’s Adjutant General, teared up as she spoke of some of her experiences. She is a member of the Governor’s cabinet and is responsible for the command of the Ohio National Guard and the military readiness of the Ohio Militia (more than 17,000 personnel). Her years of enlisted service began in the Ohio National Guard in 1978. She had stories to tell that will bring tears to my eyes evermore in remembrance. There is more than one way to honor our country’s soldiers. Each and every one of them, perhaps especially, all those who have fallen fighting for freedom, deserve honor. It’s important to think of them as individuals and comprehend they have taken an oath like none other, which literally puts their country’s protection above their own lives. Both active and retired soldiers live among us; every veteran you see state-side should be acknowledged for the service they do. Whether they help hurricane victims put lives back together, or, shoot a weapon in fierce battle-torn war zones…do not remain silent when you see them! Even the simplest gesture like a handshake will not be overlooked. There is every reason to do more, to let the brave from sea to shiny sea know your appreciation. It is the military after all that preserves the lifestyle we live here in America and you and I should thank the establishment of these protective forces every day of our lives. Don’t be shy: Take a stand; Salute any soldier you come in contact with any time you do. They will be pleased. You are bound to feel the unwavering dedication that lies deep in a soldeir’s soul when eye contact is made and gratitude is voiced. Every one of our soldiers are important to the system that provides each of us greater security in this country! PS: I wish to note that some of the picturesused in this blog post came from militiary family friends the Engleharts & the Loars. God Bless you all and thank you! FOR INTERACTIVE FUN, HOLLYWOOD COLUMBUS CASINO IS A SURE BET! Columbus rolled out a huge crowd pleaser on October 8th. A heavy stream of visitors entered the doors of the Hollywood Casino Columbus on the night I went. It was one week after this Las Vegas-style gaming club’s Grand Opening and the incoming seemed to never let up all night. This new entertainment venue will draw in an estimated annual attendance of more than 3 million people according to officials. I witnessed a standing-room-only crowd. Curiosity seekers converged on this facility’s public space to poker around. I imagine everyone left with the same electrifying impression. My parking was free. I didn’t expect that. I figured that savings would be spent inside! If all the people packed in Hollywood Columbus Casino on this Saturday night were as wowed AS I WAS, the numbers they are expecting this year in attendance could easily be exceeded? This is THE PLACE to go for a high energy good time! There was no shortage of action-packed excitement. All my senses were engaged and titillated immediately as I entered. There wasn’t even a cover charge. My mood continued to elevate during the duration of my visit. The casino sparkles inside and out. Out in the parking lot the reflecting pool multiplied the gigantic images of famous Hollywood actors projected on the building’s huge exterior movie screen. There were hundreds of various sized video screens inside too; the visual choreography of all the videos was amazing and hypnotic… my focus was demanded and it was difficult to stop staring with a bedazzled look. Everywhere my eyes could see there were other eye-catchers. Gorgeous chandeliers competed with the videos screens for my attention. An inviting glow pulls you in from the entryway; the filled seats I saw instantly told me a big audience had already been fully captivated. The beat of the Reaganomics, that night’s live band, seemed to mix properly with the 3000 thousand slot machines making constant dinging sounds. I kid you not; every seat in the house was taken, and, every Blackjack, Roulette, and Craps table was surrounded by additional onlookers all eagerly waiting to lay down chips, or, take a turn at spinning a wheel for their chance at winning a fortune. The stakes were high at all of the 30 live poker tables. Lines of people ready to hit on some big money moved with the evening. The atmosphere obviously motivated people with “cents”! It appeared everyone was having a whole lot of fun. There were ways around the stalled drink lines, so I managed my temporary discomforts. I was entertained by more than enough diversions and invigorated by the atmI was provided every bit of the heart pounding stimulation I expected while I navigated my way around the entire first floor’s 200,000 square foot public facility level. I had to keep moving, to keep in the flow of all the foot traffic parading down row after row that night.osphere during the time spent waiting to be served.The casino was as much an economic gamble as any huge development ever is, but, this has the smell of success written all over it! Now time will tell…There was exquisite decorum around every corner.I peeked in corridors and found Restaurants & Lounges beckoning for people to take a look-see. • Event Center that was actually not in use that evening, but, has over 10,000 sq. feet of event space (promenade, function rooms and terrace) that can be rented out. To see more photos and read the entire article, click here. Fall arrived these past few weeks right on cue and brought the colors of autumn to the trees in time to set the stage for a picture-perfect day at The Music & Arts Harvest Festival at Ohio Village, which was held on the grounds of the Ohio History Center. Ohio Village was the ideal setting for my up close encounter with the first fall weekend of 2012. This event gave me a virtual tour experience of a historical harvest celebration. 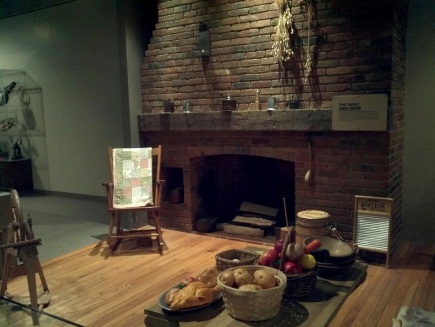 I gained new knowledge about festive activities enjoyed during the fall season by some of Ohio’s early inhabitants. I spent the day taking a step back in time on a particularly gorgeous fall afternoon. I left with the distinct feeling I had experienced the joy of a harvest celebration exactly like the people who welcomed fall many years earlier. Every visit to Ohio Village results in a different firsthand view of what life was like in Ohio during the American Civil War. The recent Harvest Festival event, as designed, shared the high value this historical population placed on fall festivities. My leisure stroll of the 15 acre grounds encompassing this living history museum site brought me face-to-face with fall in present day, but, it had a special feeling amongst a setting that taught a lot about how the former residents of this recreated 19th Century Ohio Town embraced this change of seasons during their lifetimes. I have previously attended various different events at Ohio Village and experience something new every time. There are sixteen buildings, including, craft shops, residences, and offices; an entire working village is comprehensively outfitted with realism. Depending on the time of year and theme of the event, there are always new encounters with different sights and sounds portraying the past life that was lived there. The fall season came to life with historical accuracy this time. I like the fact that I get a different point-in-time taste of the past each time I visit. This was the first time I saw how beautiful fall looked when this was an actual active rural community and I was captivated by visions of people engaged in festive harvest celebrations. I sensed significance of the harvest season with a historical perspective, which impacted my own personal feelings. Being historically connected and part of a traditional celebration of fall seemed very real that afternoon and will be remembered fondly. As I was witnessing fall in present day, I felt the euphoria it brought as I was looking through the eyes of someone who lived in the 19th Century. Every visit to Ohio Village is a life like experience of community life in Ohio during the American Civil War. 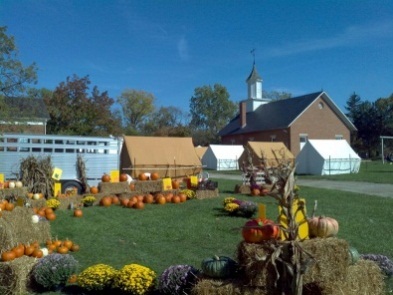 I would highly recommend visiting this living history museum during the harvest celebration season as well as other times of the year when the scenes are different. After this last encounter I will feel something more meaningful when fall arrives in the future. I will be able to think back on how I shared the values of Ohio’s earliest inhabitants and their enhanced appreciation of fall. I heard the annual Oktoberfest Um-Pa Pas coming from Columbus’ German Village and just could not resist noticing all the other festivities that make Fall Events in Central Ohio 2012 a time to get outside to enjoy the foliage and so much more! The luring list of attractions added to my busy must-do list. My favorite fall fun includes the corn mazes I can master and after hour bon fire bonding with friends! I am having real difficulty this year deciding what venue to visit! I know I will be indulging in several pumpkin picking play dates in order to multiply my pleasure! It is fantastic to see so many pumpkin patches featuring full blown festivals. Children and adults of all ages are promised hours of family-friendly enjoyment! I could personally spend hours on a hay wagon crunching on kettle corn. It’s awesome running into neighbors loading the backs of their minivans with the fruits of this season’s harvest. Many memories I cherish were made meandering a local farmer’s field in years’ past. I always do some serious scouting for my perfect carving specimen before Halloween. I have had many pumpkin pleasure visits at Freeman Farms in Galena; I stopped by this past weekend to initiate this season’s fun for me. I was not surprised by the big turnout they already had. I could not stay long, but, I did get to say hello to the owner, Bill Freeman, who was one of many workers making sure the flock of pumpkin pickers that day were all smiles. Although a good number of today’s visitors tote smart phones and other electronic devices for taking pictures, it was evident that good old fashioned fun of picking pumpkins got them to head to the farm. All their other modern-day distractions were the farthest things on people’s minds on this sunny Saturday afternoon as they spent quality time leisurely enjoying the atmosphere at Freeman’s, which included face-to-face time with the petting zoo livestock . I also managed a quick visit to Sambuca’s Italian Greenhouse on Saturday. I was drawn there by the giant inflatable cat in front of their pumpkin display, visible from State Route 3. They were in the middle of a fall festival of their own and I was offered a tour of their “Haunted Tunnel”… Beware! The colorful mums and ginormous pimply gourds I got to see and photograph made up for the scare their mummy gave me! Another very tempting Community Event I decided not to miss was this year’s fourth annual Mosher Apple Butter Festival. I arrived as the apple press began dripping sweet liquid, which was also when it began to drizzle. The event just got underway out on the grounds of McVay Elementary School in Westerville. Even in the rain others were arriving and there was a warming reception at the wood burning fireplace inside the log cabin, which is tucked into a gated preserve area of this school site; a fitting place to have the Apple Butter Festival event! The demonstrations of apple-cider and apple-butter making continued under umbrellas held high. It was decided that it would be good-hearted to continue on with the day’s plans in honor of Ned Mosher, the outdoorsman and Westerville City Schools teacher whose efforts led to moving and rebuilding the log cabin 30 years ago. Mosher took his former students to the cabin to conduct science lessons. It’s been used ever since to teach about history of syrup-making in Ohio. What I also learned about this original 1840 log cabin, was that it used to sit across the road from one of Westerville’s more widely known Historical structures, the present Everal Barn at Heritage Park on Cleveland Avenue. Moving this smaller piece of Ohio history was done courtesy of the local Lion Club’s past “cabin raising” on one of their annual World Lion Club Service Days. Other quick facts I discovered were that some of this log cabin’s former owners deserve to be thanked for helping Otterbein College become the successful campus it is today. And, that another one of the cabin’s former residents was the first African-American to graduate from high-school courses. This years’ Apple Butter Festival taught me about the hard working accomplishments of these special people. It also supplied me with the taste of some ‘mm-good’ fresh apple-butter, which I will be spreading on my morning bagels and savoring in the days ahead.